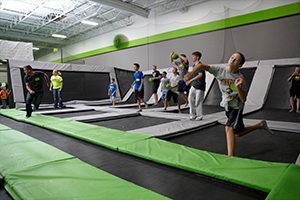 Trampoline Dodgeball Courts in Minneapolis! At Zero Gravity Trampoline Park we’ve come up with the ultimate way to experience dodgeball. This is not your grandfather’s dodgeball! This high-energy, fast-paced game will blow you away. We offer dodgeball for all players, but the youngest players have their shot at glory on their own smaller, more laid-back court. 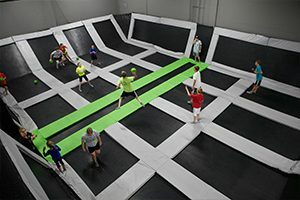 We’ve got great news for those of you excited about the idea of playing dodgeball on a trampoline but worried about the price: It’s included in your jump pass! As always, you choose the pass that works best for your needs, whether you want to purchase a basic jump pass or take advantage of the savings in our Ultimate Pass, you can play dodgeball to your heart’s content with no additional charge. We at Zero Gravity know that our regular dodgeball players want high-energy, exciting games but we also know that parents are looking for dodgeball games for kids that are a little less intense. That’s why we have two courts: one for intense play for older players and one for the younger kids. Both are exciting, and our guests can choose which court fits their needs. Dodgeball + Trampolines = FUN! Play one dodgeball game on our trampoline courts and you’ll be hooked! For an additional fee, you can get your friends involved by reserving one of our courts for your own private event! Throw your next birthday party here, get your company’s morale up with a dodgeball lunch break, or reserve it for your next family reunion. Most of us learned to play dodgeball in elementary school so what better way to experience Grad Night, 8th grade graduation, or any other school experience than with an afternoon or evening playing trampoline dodgeball? Contact us to learn more about school rates. If you’re hit by a live ball, you’re out. If you throw a ball and it’s caught by a player on the other team, you’re out. If you cross the center green line, you’re out. There are no head shots allowed. We have coated foam balls for these amazing dodgeball games to ensure there’s no risk for injury. Even with private reservations, we always have one dodgeball court open to the public, so you can always play! You really haven’t dodged a ball if you haven’t played dodgeball on trampolines. Come to Zero Gravity to experience dodgeball in a whole new way! We also have Party Packages to fit any size group or budget, Zero Gravity is the place to hold your next birthday party, group celebration, or team building event. Private party rooms are available for groups from 10-40 guests. Book online now or call us at (763) 231-3033.